The Angriest: Star Trek: Voyager: "Meld"
It is 15 February 1996, and time for another episode of Star Trek: Voyager. 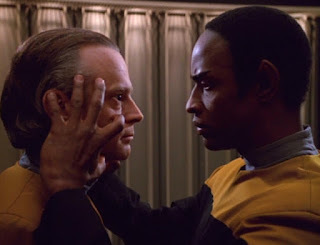 The shocking murder of a Voyager crew member leaves Lieutenant Tuvok (Tim Russ) on a dangerous journey as he tries to rationalise the motivations of the killer (guest star Brad Dourif) and understand the logical purpose of a random act of violence. When Voyager was originally broadcast, it was widely seen - quite rightly in my opinion - as the more breezy and upbeat alternative to companion series Deep Space Nine. The latter series had a cynical 'realpolitik' edge that separated it from its predecessors, and which was not popular with all franchise viewers. If one was not interested in the darker and more bleak take on Star Trek that Deep Space Nine offered, one could always stick to Voyager for something more in keeping with The Next Generation's generally utopian outlook. Then "Meld" was broadcast, and for at least one week Voyager went dark. It went really dark. "Meld" is a tremendous episode, because it asks several fantastic "what if?" questions that provoke Tuvok into uncharted and dramatically rich territory. Tim Russ has suffered to date with what is arguably Voyager's blandest character, and has lacked opportunities to actually stretch himself as an actor and demonstrate his talent. He is excellent here. Sadly I don't remember him being given material this strong again. What if a Starfleet officer turned out to be a serial killer? What if he's caught on a single Starfleet vessel separated from the nearest Federation prison by 70,000 light years? What would you do with him? How do you punish him? These are hugely difficult questions to pose for an one-story-a-week mainstream drama series, and it is a genuine credit to the Voyager production team that these questions do not get convenient or closed-off answers. Brad Dourif is a tremendously gifted actor, first coming to the notice of audiences with his masterful performance as Billy in Milos Forman's 1975 film One Flew Over the Cuckoo's Nest. Thanks to his understated, eerily calm performance here - not to mention a well-used pair of black contact lenses - he makes unrepentant murder Lon Suder someone that is simultaneously frightening, unsettling and oddly sympathetic. Tuvok, as a man committed to a lifelong ethos of logic and calm, is entirely unequipped to deal with the crime at hand. There is no real motive to Suder's act, a truth which he is simply incapable of accepting or understanding. An ill-advised attempt to mild-meld with Suder certainly gives Suder a temporary respite from his homicidal urges, but at the same time it exposes Tuvok to the murderous rage that he and other Vulcans have always fought to keep in check. As with Suder's story, the episode does not pull its punches. It exposes a shockingly ugly side to Tuvok that turns out to have always been there. Dourif and Russ work very well together, in an episode that is anchored by a string of interactions between the two. It concludes in a fairly surprising and deeply effective fashion, and certainly in a way I would not have expected Voyager to undertake. This is very likely the best episode of the series since the pilot; it's possibly the best so far. As the 10th good episode out of 16 this season, it lifts the quality ratio up to 63 per cent. Highlander: The Series: "Revenge is Sweet"
Star Trek: The Next Generation: "Emergence"
Highlander: The Series: "The Sea Witch"